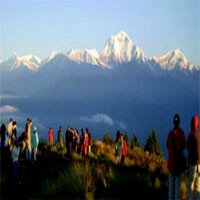 Namobuddha Panauti day hike itinerary starts an early morning from Kathmandu driving for about 3 hrs to Namobuddha passing Dhulikhel and sees the panoramic Himalayas, Monastery, and other Buddhist monuments. Namobuddha is one of the famous Buddhist site which has a long history of the third Buddha (Kasyapa Buddha). 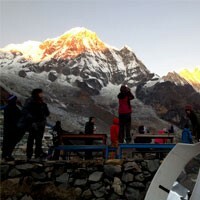 We see the panoramic mountain view of Ganesh Himal, Manaslu, Langtang, and Jugal ranges with the valley, green hills, farming terraces, and more from Namobuddha than hike 2-3 hrs to Panauti where we visit historical temples, museum, and a traditional old Newar town. After visiting the Panauti, we drive back to Kathmandu. Day 01 : Drive early morning to Dhulikhel. visit Namobuddha,hike to Panauti and drive back to Kathmandu. Our Experienced and knowledgeable guide takes us with private transport in the morning from our hotel to Dhulikhel. Dhulikhel lies to east from Kathmandu. 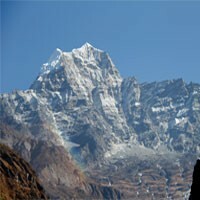 We start our hike with the beautiful mountain view, valley, villages, nature and more until Namobuddha. Namobuddha on the hill station with the beautiful monasteries and more Buddhist monuments. After visiting this place we hike down to Sunthan about 2 hours where our car will be waiting for us then drive to Panauti. after visiting historical temples, old Newar town, and more here we drive back to Kathmandu. Overnight at the hotel.